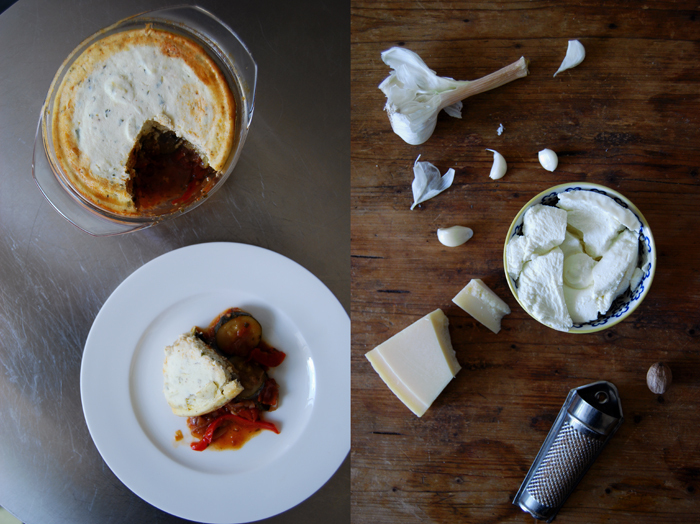 My Moussaka, truth be told, is a fruity ratatouille baked with a fluffy lemon ricotta soufflé on top. The traditional Greek Moussaka is made with a Béchamel sauce which I’m not too fond of. I like this creamy sauce in my lasagna or cannelloni but that’s it. The ricotta tastes much lighter, enhanced with lemon zest, nutmeg, parmesan and fresh basil, it gives this dish more of a summer feeling. Contrary to the Greek version, I kept mine vegetarian, there’s no minced meat involved, just zucchini, bell pepper, tomatoes, red onions, lots of parsley and a velvety layer of fried aubergine slices in between the vegetables and the cheese. 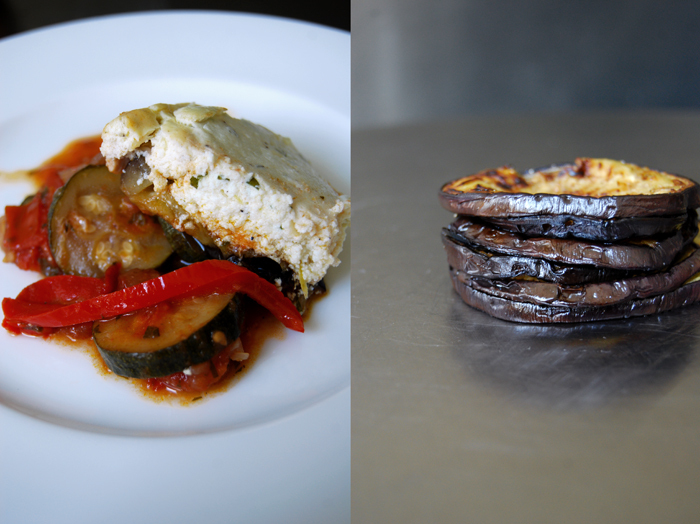 It stops the ricotta from running into the juicy ratatouille. When I cook a ratatouille I always make a big batch. 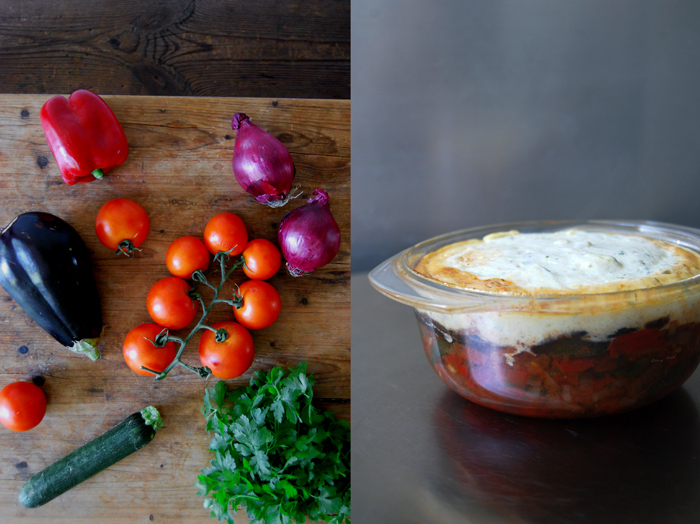 This moussaka is perfect as a second day dish for ratatouille leftovers. Topped with the ricotta it just has to bake in the oven for half an hour, great if you have friend’s over for dinner and not much time for preparations! I baked it in small casserole dishes closed with a lid so that each of us could have our own little pot. I bake the Moussaka in two 12,5cm / 5″ casserole dishes with lids, you could use a big one instead but you may have to bake it a bit longer for the ricotta to set. Spread the slices of aubergine on a baking dish and sprinkle with salt on both sides to pull some of its water out. Let it sit for around 15 minutes, rinse the slices and dry between kitchen roll paper. In a large heavy pan, heat a splash of olive oil and fry the aubergine for a few minutes on both sides on medium temperature until golden and soft, add a little more oil if necessary. Season with salt and pepper and set aside. In a large pot, heat a splash of olive oil and fry the onion for a few minutes until golden and soft. Add the bell pepper and garlic and fry for 2 minutes before you add the zucchini. 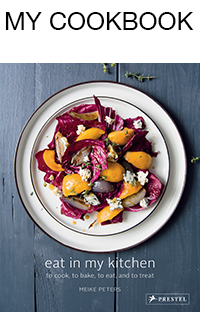 Fry the vegetables for 2-3 minutes and deglaze with 2 tablespoons of Balsamico vinegar. Add the tomatoes, season with salt and pepper and cook for 10 minutes. Add the parsley and season with Balsamico vinegar, salt and pepper to taste. For the topping, mix the ricotta, eggs, parmesan, basil, lemon zest and juice and season with nutmeg, salt and pepper to taste. Divide the vegetables between the 2 casserole dishes, cover with 3-4 slices of aubergine and spread the ricotta mixture gently on top. Cover with lids and bake for around 35 minutes until the ricotta mixture is set. This sounds like a lovely version of moussaka – I love the lightness of the lemon ricotta and all the delicious veggies!